Will There Be a “Final” Offensive on Idlib Province? The Assad regime has pledged an assault to retake Idlib Province in northwest Syria, the last major opposition area in the country. Russia is urging Turkey — which has forces alongside rebels in Idlib, northern Hama, and western Aleppo Provinces — to accept the attacks on “extremists”, but Ankara is resisting. Idlib Province contains opposition fighters, activists, and civilians displaced from Homs, Aleppo, Hama, and various parts of Damascus. A once tiny area with a 2011 population of 1.5 million now holds an estimated 2.6 million people who fled or were forced into Idlib as part of “reconciliation” agreements with the regime. Because of the regime-imposed consolidation of opposition fighters in Idlib, analysts speculated that Idlib would be the next great battle. Major battle fronts in opposition held areas — namely Homs, Aleppo, and Eastern Ghouta, among others —h ave succumbed to the regime’s brutal war tactics of bombardment and siege. Idlib now remains the last major opposition territory for the regime to control, but it is not without its complications. 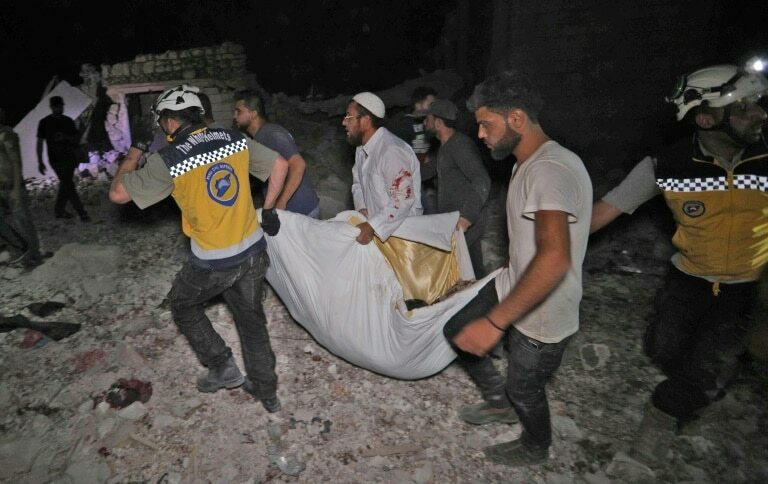 The regime ramped up air strikes on August 10, 2018, which left dozens of casualties and injuries in their wake. The ongoing regime targeting of Idlib goes as far back as 2012 and uses air strikes, shelling, and chemical weapons attacks of varying intensity. These attacks often targeted hospitals and schools for maximum casualty impact. These specific targets also served to remove basic services and further eroded civilian relationships with opposition groups. The same strategies were used in Homs, Aleppo, and Eastern Ghouta, which eventually led to the surrender of opposition groups and the forced negotiation of reconciliation agreements that displaced large populations. The majority of these displaced people often ended up in Idlib Province; leaving the regime to control the cities without dissent. It is no surprise that Bashar al-Assad used this successful tactic across the country and specifically in Idlib. Reports of Syrian regime forces gathering troops and weapons on the outskirts of Aleppo province, bordering Idlib to the east, further point to potential military action. Military officials from armed opposition groups in the north declared a gathering of a united front to counter the upcoming regime offensive — a common tactic used in previous battles to maintain opposition territories; while distinctly separating themselves from rivals Hay’at Tahrir al-Sham (HTS, formerly Jabhat al-Nusra). Opposition groups have ideologically distanced themselves from the extremism of HTS out of necessity; what was left of US aid did not extend to this UN-designated terrorist organization, or groups that ally with HTS, before funding was cut off in May 2018. Even if members may agree with HTS strategies, opposition groups risk losing international legitimacy with its Turkey and Gulf backers and local credibility with residents that strongly oppose HTS. As it sought to control the area, HTS left its mark on civilians with kidnappings, raids, assassinations, and ongoing battles with local opposition groups. The battle for Idlib continues to be both an internal battle between opposition groups and HTS, and an external battle potentially involving Turkey and regime-allied forces. In the eyes of the regime, a challenge to the invasion of Idlib is the high density of the province, due to displaced communities, which promises widespread civilian damage and thus the removal of a large dissident population. The UN warns that 700,000 people could be displaced by a potential offensive and flee north to Turkey. Still, symbolically, re-gaining control of a long-standing opposition territory is an appealing outcome for the Assad regime. However, now more than ever, the final offensive in Idlib comes with significant complications. Turkey is a formidable power to face, and Ankara has stated that Idlib is an important area for its security interests, warning Russia to mediate with Assad to avoid a confrontation. Russia, Turkey, and Iran are guarantors, charged with maintaining the northwest de-escalation zone as part of the Astana agreement. If the regime moves forward with the final Idlib offensive, this would jeopardize the agreement with the Syrian regime crossing Turkey’s “red line”. Ankara has indicated this would destroy the agreement and push it to throw its full support behind armed opposition groups in response. As the host of the Astana talks, Russia is unlikely to favor this result. Turkish Foreign Minister Mevlut Mevlüt Çavuşoğlu met with Russian Foreign Minister Sergei Lavrov this week, and he maintained Turkey will not allow the massacre of civilians in the province in efforts to “remove” terrorist groups as part of the Astana agreement. Turkey’s motives seem tied more to the removal of elements of the Kurdistan Workers’ Party (PKK) and the return of Syrian refugees, than to protecting current Idlib residents. But with Turkey’s Operation Olive Branch securing the Afrin area of Aleppo Province — north of Idlib — and implementing “safe zones”, observation points, and local police forces, Ankara is significantly invested in the area and is unlikely to retreat anytime soon. Indeed, Turkish President Recep Tayyip Erdoğan has hinted at creating additional safe zones throughout northern Syria. Turkey is likely to concede southern parts of Idlib Province to Russia and the regime because it is unwilling to risk direct confrontation with both states — as long as the final offensive does not threaten its interests in limiting Syrians crossing the border. Turkey fears mass displacement, but it is unlikely to interfere unless Russia and the regime move further north. This position is also an effort to keep the regime from working with elements of the Kurdish-led Syrian Democratic Forces in the offensive. Kurdish SDF representatives met with the regime at the end of July and a second time last week to discuss maintenance of self-rule in northern Syria — and potentially indirect protection from Turkey — in exchange for withdrawing from Arab majority areas. It is unlikely that the regime will honor this agreement if it comes to fruition long-term, but this tactic could satisfy its immediate concerns and keep Turkey at bay while it hedges. While most opposition-held areas agreed to “reconciliation” agreements, not all areas remain stable. Violence continues in the southwest due to elements of the Islamic State who have taken up residence in areas of Daraa and Sweida and who are becoming more bold with executions, kidnappings, and bombings. Further escalation from Iranian militias and Hezbollah fighters along the border in the Golan Heights continues to push Israel into more military engagement, including airstrikes. The escalation is such that the UN is preparing to send in a UN Disengagement Observer Force (UNDOF) to mitigate tensions in the volatile area, its first operations since 1974 after the Arab-Israeli War of the previous year. While the Syrian regime is likely to move forward with a final Idlib offensive, it will need to prepare for potential confrontations with Turkey. If past battles are any indication, Russia will continue to go through the motions of diplomacy while supporting the regime through its air force, with a prolonged defense by armed opposition groups. There will be mass destruction and displacement. It remains to be seen when this imminent offensive will occur, if Russia can manage to restrain the regime from overtaking the entire province, and what the extent of the mass civilian exodus and casualties will be.